Not many people tend to be happy with a back row seat. Lisa Pankratz isn’t complaining, though, about hers. 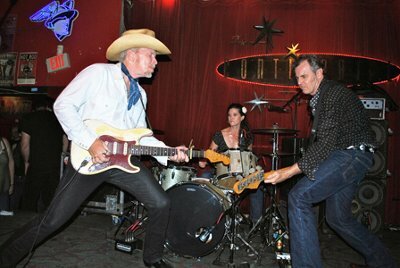 Pankratz, the longtime drummer for West Coast roots-rocker Dave Alvin, has had a great view of Dave’s reunion with brother Phil over the last few years. The two founding members of The Blasters went through an extended period of estrangement before reconciling several years ago. She will also have a great view on Saturday as she looks out on the Safeway Waterfront Blues Festival crowd when the Alvin’s play on the Brewery Stage at 7:15 p.m.
I’ve been a fan of Pankratz for some time now, in part because our musical circles overlap. 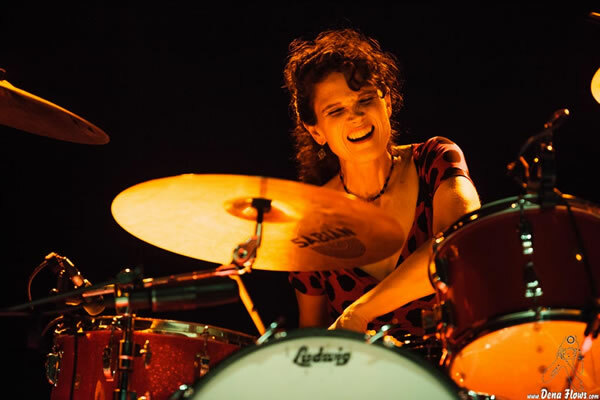 More interestingly, she’s carved out a pretty solid spot in the male-dominated world of drumming. We recently spoke by phone from her home in Austin. Pankratz began playing with Dave in 2008 after what was supposed to be a one-off gig at the Hardly Strictly Bluegrass Festival. Dave is a regular at the fest and tries to keep the set fresh year to year. For 2008, he brought in a collection of the best female artists he could find and called them The Guilty Women. “We literally did a little half an hour rehearsal behind the stage in the tent. I had gotten a heads up on a few songs and up we went. There was a little part of me that was kind of terrified. I’d never played with him before,” Pankratz recalls. 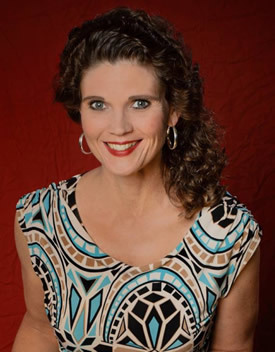 After touring in support of the album, Pankratz returned to Austin to continue her other projects, most notably The Texas Guitar Women with Cindy Cashdollar, Sarah Brown, Carolyn Wonderland, and Shelley King. In 2010, Phil nearly died while on tour in Spain. He was actually pronounced dead, but a determined medical staff revived him. The event shook both brothers and set in motion their reunion, putting aside any past differences. At the same time, Dave had finished recording “Eleven Eleven” and was looking for a band to back him on tour. Dave saw Pankratz and her husband Brad Fordham performing in Austin and recruited them for the tour. With a solid band in place, the Alvin brothers headed to the studio to cut last years “Common Ground: Dave & Phil Alvin Play and Sing the Songs of Big Bill Broonzy.” The album, which I reviewed last year, pulled from material the brothers cut their teeth on as youngsters. “Common Ground” was so well received that Phil and Dave are following it up in September with “Lost Time.” Like last year’s release, the album goes back to music that influenced the pair and includes songs from the Golden Gate Quartet, Lead Belly, and Big Joe Turner. Not only is Dave a masterful lyricist, he also has a remarkable affinity for arranging. In creating the arrangements for these two albums, he has simultaneously stayed close to the origins of the songs and put his own stamp on each. On Saturday, Dave and Phil will be backed by The Guilty Ones, with Pankratz being joined by Fordham (bass) and Chris Miller (guitar), the trio that Dave and Phil have been recording and touring with the last few years. Audiences have been thrilled as well to see the two reunite.